It started as an eight-year old’s neighborhood lemonade stand for a good cause — to free child slaves. 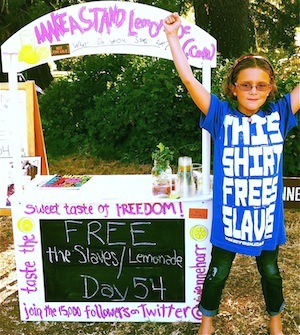 But within a year little Vivienne Harr ignited a movement and inspired a new family business: a public benefit corporation working to end child slavery by putting their Make a Stand Lemon-aid in retail outlets, starting with 150 grocery stores on the West Coast. And we’re proud and delighted that Nepal Youth Foundation has been selected as one of six organizations being supported by Make a Stand. When Vivienne was eight, she came across a haunting image by acclaimed photographer Lisa Kristine. It was a photo of two young boys with heavy stones strapped to their backs. Vivienne’s parents explained that the boys were child slaves, that „slavery didn’t end with Abraham Lincoln“ — and that, tragically, there are about 18 million child slaves worldwide today. Within a few months, Vivienne’s „Make a Stand“ campaign was covered by the New York Times, BBC World News, ABC, NBC, CBS, Parenting Magazine, The Huffington Post, FOX, MSNBC, Yahoo News and more than 200 other media outlets across America and around the world. By day #173 she reached her goal of $100,000. 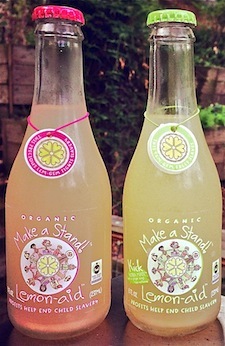 By the end of day #365, Vivienne and her family decided to keep the campaign going by bottling their organic, Fair Trade Certified „lemon-aid“ — and Make a Stand, Inc. was born. Make a Stand is donating 5% of their gross sales to six organizations that „do the most documented work in eradicating child slavery.“ The Harrs have also started the nonprofit Make a Stand Foundation to raise additional funds for those six organizations. Soon the story of Vivienne and Make a Stand will be coming to a theater near you in a beautiful, engaging and inspiring new feature documentary called #standwithme. The film educates viewers about child slavery through the work of Lisa Kristine and two organizations with a global reach: Free the Slaves and Fair Trade USA. And right in the middle of #standwithme is a segment showing a meeting between Vivienne and her family and our very own Olga Murray, NYF’s Founder and Honorary President. It’s heartwarming to see 9-year old Vivienne and 88-year old Olga talk about their shared passion for ending child slavery. #standwithme opens in February 2014 with a 30-city tour of North America, and it’s certain to earn broader distribution and reach a worldwide audience. We are so grateful to Vivienne and her parents, Alexandra and Eric, and to everyone at Make a Stand for their commitment to ending child slavery and their support of our work here at Nepal Youth Foundation. We’ve rescued over 12,000 girls from indentured servitude and ended the system of Kamlari in Nepal. Now we’re working to empower the newly freed young women through vocational training, leadership development and economic opportunities. Watch the CNN Freedom Project video about NYF’s work to free girls from slavery. Read the Time Magazine article about NYF’s work to rescue the last Kamlari slaves. This is a great idea and very exciting. It shows what kids can do!